Located on a peninsula between Mississippi and Biloxi Bay, the city of Biloxi has become a very popular tourist destination that attracts so many visitors from other places in America and from abroad. Until today, tourism continues to be the main industry in this city that has driven the growth of other industries, such as boat building, fishing, accommodation, culinary, transportation, and many others. As a famous tourist destination, Biloxi has so many tourist attractions, including the famous Biloxi Lighthouse, Tullis-Toledano Manor, The Redding House, Old Brick House, Jefferson Davis Home, JL Scott Marine Education Center and Aquarium, Aces High Parasail, Gulf Coast Symphony Orchestra, Saenger Theatre, and so much more. There are also many touring facilities in the city, such as Hotard Coaches & Magnolia Coast Tours, Biloxi Tour Train, Biloxi Schooners, Biloxi Historical Walking Tour and many more. For sports and adventure enthusiasts, Biloxi has lots of great activities to choose from. Two of the most popular activities are golfing and fishing. There are a lot of wonderful golf clubs in Biloxi with fabulous golf ranges, including the President Broadwater Golf Club and Dogwood Hills Golf Course. Adventure seekers could enjoy staying in one of the beautiful lodges and resorts scattered all over the city that put them very close to the action. However, Biloxi is most known for being a casino city. Ever since gambling was made legal in this city, Biloxi, Mississippi has become one of the main destinations of gambling tourism in the USA. 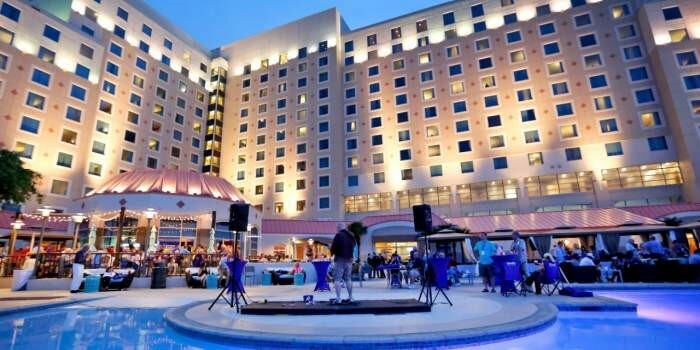 There are so many casinos you can find in Biloxi with different sizes and facilities. These casinos usually take place inside luxury hotels. You don’t have to stay in the hotel to try your luck in these casinos, but if gambling is the main kind of entertainment you wish to have during your travel and you happen to have enough budget, then staying in one of these hotels would be nice. With 1,740 rooms spread over 29 floors, this 4-star hotel is the most popular casino-hotel in Biloxi. It has 5 restaurants, 2 bars/lounges, full service spa, outdoor pool, nightclub, fitness center, business center, and of course a classy casino with various table games and slot machines. The rooms are equipped with great facilities, including private bathroom with separate bathtub and shower, premium bedding, LCD TV with cable, WiFi, iron/ironing board, refrigerator, and more. You can also bring your pet in this hotel. This is a 4-star resort with 8 restaurants, located near the famous Biloxi Lighthouse. It has 1,088 rooms that are equipped with lots of nice facilities, including Hypo-allergenic bedding, plasma TV with cable service, WiFi, refrigerator, coffee maker, in-room safe, plus daily housekeeping. Main amenities include full-service spa, nightclub, seasonal outdoor pool, health club, free parking and others. Besides Biloxi Lighthouse, some other famous attractions located nearby are Redding House, Cathedral of the Nativity of the Blessed Virgin Mary, John Henry Beck Park and Boomtown Casino Biloxi. Located in East Biloxi near the beach, this 4-star hotel has 499 rooms with facilities including 49-inch TV with digital TV channels, premium bedding, WiFi, refrigerator, microwave, luxury bathroom, also connecting rooms available. Hotel amenities include7 restaurants, 3 bars, coffee shop, poolside bar, outdoor pool, fitness facilities, spa, conference space, hair salon and others. Some interesting attractions you can find nearby this hotel include the Biloxi Lighthouse, Point Cadet Plaza, Maritime and Seafood Industry Museum, Point Cadet Marina and St. Michael Parish Catholic Church. With 706 rooms spread over 15 floors, this charming casino-hotel is located near the beach. Hotel amenities include luxury casino with many table games and slots, nightclub, fitness center, 14 meeting rooms, full service spa, 4 restaurants, 7 bars, 2 outdoor pools, and others. Facilities inside the rooms include 49-inch plasma TV with satellite TV channels, premium bedding, WiFi, refrigerator, microwave, luxury bathroom, coffee maker, in-room safe, and more. This is a more affordable option for casino-hotel that still offers all kinds of great facilities. This 3.5 star resort has 207 rooms with facilities include premium bedding with pillowtop mattress, flat screen TV with cable channels, luxury bathroom, free WiFi, coffee/tea maker, in-room safe, and others. Hotel amenities include 3 restaurants, poolside bar, outdoor pools, conference space and meeting rooms, 24 hour room service and many more. This resort has a great casino with lots of slots and table games.